Israel opens the Kerem Shalom crossing and allows 700 truckloads of goods to enter Gaza. Israeli authorities on Thursday opened the Kerem Shalom crossing into Gaza, allowing 700 truckloads of goods to enter the region, the Ma’an news agency reported. The head of the Commission for the Coordination of Goods into Gaza, Raed Fattouh, told the news agency that among the good entering Gaza were construction materials for internationally-funded projects, fuel, and materials to improve the strip's infrastructure, particularly roads. 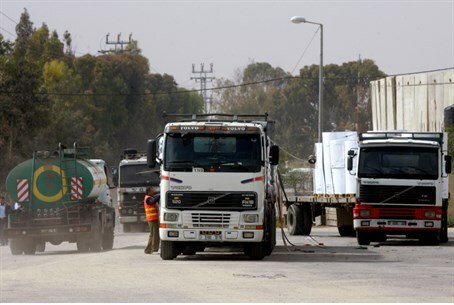 Thursday's entrance of diesel, building materials, aid, and supplies through the Kerem Shalom crossing came after a series of closures due to Israeli national holidays, noted the report. The crossing is scheduled to be closed again Friday and Saturday for the weekend. Gaza’s Hamas terrorist rulers continuously claim that Israel is imposing a “siege” on Gaza, despite the fact that Israel continues to transfer humanitarian aid, goods and construction materials into the region. Israel has continued to do so as terrorists from the region fire rockets at southern Israel. The transfer of goods into Gaza came just hours after the UN’s new envoy to the Middle East, Nickolay Mladenov, blamed Israel’s “blockade” of Gaza for the slow pace of the region’s reconstruction following Operation Protective Edge last summer. "I strongly believe that it will hurt the cause of the Palestinian people if division, if the lack of unity, is not addressed as soon as possible," Mladenov told reporters in Gaza City. "I hope that the United Nations will be able to support the efforts to strengthen this unity," he added. Hamas has already threatened another war if Gaza is not "rehabilitated" from the war against Israel, which it itself both started and used civilian areas as a base for conflict.